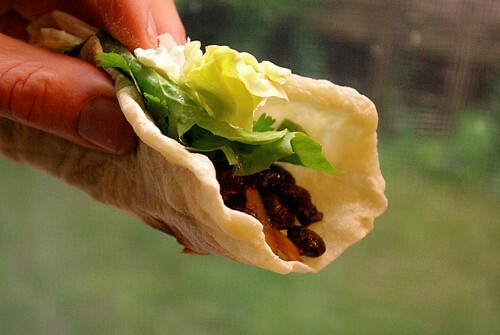 spicy black bean and fresh cilantro wraps in buttery broiled flatbreads, originally uploaded by aarn! +18th June, 2009+. sauteed some onions and black beans in a little oil, and seasoned with garlic, chili powder, some hot sauce, salt and pepper. cut 1.5T. butter into 1 3/4c. flour, added a pinch of salt, then slowly mixed in 3/4c. or so of luke warm water. folded/kneaded until smooth, and still goopy, then let sit for an hour at room temperature. rolled small balls of the dough out on a well-floured surface, then put them on a rack in a sheet pan and broiled each side until lightly colored, but not dry. topped the chapatis with some of the spicy beans, a splash of salsa, some fresh salad greens, fresh cilantro, and a little crumbled feta. Sweet lovin' jeebus. This looks downright fantastical. The flatbread!